How do I program my petPod? Insert 2 AA batteries. Turn on the petPod. The LCD display will enter TIME SET mode. The SET indicator and the hour position will start flashing. The clock is a 12-hour clock with AM/PM indicator. Set the time. To set the hour, press the + button. Press ENT when the hour is correct. To set the minutes, press the + button. Press ENT when the minutes are correct. Set the day. The default is MON. Press the + button to alter the day. Press SET when it is correct. Pressing ENT again resets the time and date. When the time and day are correct press SET. The feeder will enter TIMER 1 set mode. After setting the petPod’s time, you will enter TIMER 1 mode. SET, TIMER 1, and hour will start flashing. Now you can set the time when your pet will get fed. Set the time. To set the hour, press the + button. Press ENT when the hour is correct. To set the minutes, press the + button. Press ENT when the minutes are correct. The timer will not set properly unless you set the minutes as well, so if you do not want to set the minutes you must leave it as 00 not --. Set the day. The default is MON. Press the + button to alter the day. Press SET when it is correct. Pressing ENT again resets the time and date. When the time and day are correct press SET. After SUN there is a DAILY indicator. When DAILY is set the timer (left hand lid) will activate at that same time every day. If you choose this option in TIMER 1, TIMER 2 is automatically set to daily also as default (you have the option to alter the time of opening). When TIMER 1 time and day is correct, press SET. The feeder will now enter TIMER 2 set mode. If you only want to set one feeding time, press SET again to enter run mode. After setting the first feeding time, you will enter TIMER 2 mode. SET, TIMER 2, and hour will start flashing. Now you can set the second time when your pet will get fed. After SUN there is a DAILY indicator. If you chose DAILY for Timer 1, this is the only option for TIMER 2. Press the + button to change the day. When TIMER 2 time and day is correct, press SET. Setup is now complete. The feeder will now enter RUN mode. If both TIMER 1 and TIMER 2 are set to the same time, and are both set as ACTIVE, then both left hand and right hand lids will activate at the same time and open the lids. 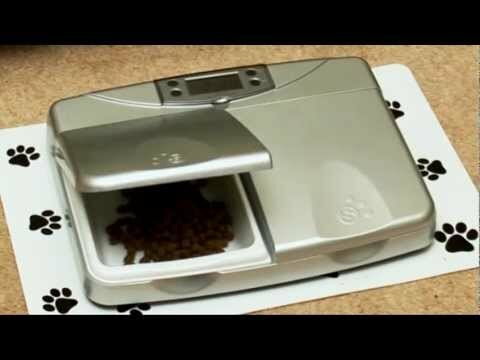 How to set up and use the petPod™ feeding system, by PetSafe® Brand. petPod™ will automatically take care of feeding your pet with completely digitally timed accuracy. It will care for your pet just as you would, dispensing meals and medication at the right times. With an easy-to-read LCD display, you can set the times your pet will eat.